I am considering switching to the Anthracite Brushed Aluminum Interior Package and would love to see some photos of interiors with that specification. Please include the console too. Looks great but my issue is you still have the door handles, steering wheel, and shift *** in the standard silver. And the lower door trim, the vent trim and the glove box handle. Are you saying the standard brushed aluminum is a better match with the shiny silver pieces? I found anthracite better, because brusched alu and shiny plastic silver pieces don't match. Hey lamarmotte, don't get me started on those sport buckets! Not enough of a difference to delay your car. Exactly. This is something that is best seen in the flesh. The standard brushed aluminum trim doesn't really match the shiny (non-brushed aluminum) on the door handles, gear shift, and sports design wheel. The aluminum look trim is kind of shiny, yet still manages to clash with the shiny door handles, and is not as elegant looking on the dash trim, particularly next to red, black, and alcantara. You need to see these back to back in the flesh which is why I flew to another state this weekend to check this out and several other GT3 options. I looked at two GT3s within an hour of each other. 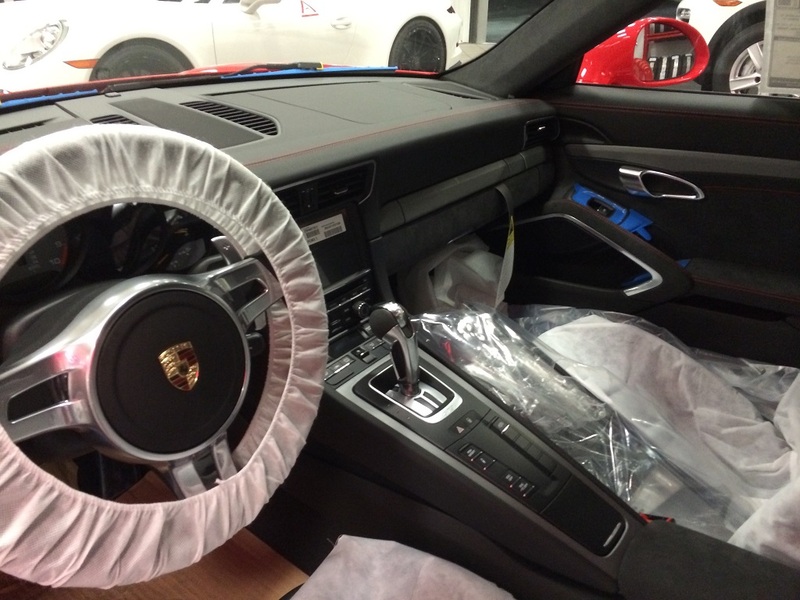 Both had the deviated red stitching. One had anthracite trim, one had regular aluminum trim. The anthracite was much more elegant and looked like it belonged on a high-end sports car. It reminded me a bit of a Ferrari interior. And it matched the colors better. The Anthracite blends really well next to the alcantara on the dash trim and the door. As a side note, I think the anthracite is a must have if you order deviated red stitching as the doors look far better with anthracite and it does better job of blending the 4 colors on the dash. However, if you order the full leather/alcantara interior without the red stitching, I don't think it's necessary to order the anthracite, and I think it looks better in standard brushed aluminum. Macca said the same about his standard full leather car. Last edited by Drifting; 01-13-2014 at 10:27 PM. Reason: . It's Anthracite per other discussion in this thread or another (can't remember). What about the carbon fiber trim? Did you see a car with that? I've tried pulling all kinds of photos and the gloss on them make it hard to see what what they would look like in person. The flash from whatever camera seems to always create a reflection..
Quick Reply: Can someone post some photos of the Anthracite Brushed Aluminum option?